Are you looking for ways to add ambiance and value to your home for little work at moderate cost? Then consider installing crown molding. After all, there are few other building materials that you can apply to your home in so little time that give your home such an expensive-looking touch. Crown molding is a value-added home project that takes just a weekend to apply for a medium-sized space, such as one living room or two bedrooms. Yet, if you've pored over crown installation tips and videos, you will get an uneasy sense of crown's exacting nature. Cuts that are less than precise can lead to misaligned trim. For the best possible results, this guide adds dimension and depth to the general topic of crown molding installation and briefly covers supplementary topics like installing crown on cabinets or on vaulted ceilings. While you can miter-cut crown molding with a manual miter box and saw, it's better to use an electric miter saw, as cuts will be more precise. Do not cut the crown flat on the table (the horizontal part of the saw) or against the fence (the vertical part) of the saw, as you would a piece of straight lumber. Instead, you will orient the material on the saw at a 45-degree angle, upside-down. So, the part of the crown that will meet your ceiling should rest on the saw's table. The part of the crown that will meet your walls should rest against the saw's fence. An inside corner is one with an inward facing 45-degree angle of two walls. A halfway open book whose pages are facing you is an example of an inside corner. For the Left Side of the Corner: Miter right at 45 degrees. Discard the left side of the cut and save the right side of the cut. For the Right Side of the Corner: Miter left at 45 degrees. Discard the right side of the cut and save the left side of the cut. Outside corners have a 45-degree angle that opens in an outward direction. A halfway open book whose pages are turned away from you (and the spine toward you) is an example of an outside corner. For the Left Side of the Corner: Miter right at 45 degrees. Discard the left side of the cut and save the right end of the cut. To install your crown molding on the wall, flip it over so that it is upright. Recruit a helper to help you manage the crown, as you mount the ladder to set it into place. Begin at the center of the wall. The crown should form a 45-degree angle against the wall and ceiling. Make certain that the angle is precise. While slightly imprecise angles do not matter much for the individual piece of crown, problems happen when you try to match two pieces of crown molding at any meeting point: straight runs, inside corners, or outside corners. With your electric nailer, drive brad nails through the wall side of the crown. Ideally, you should aim for wall studs. In a pinch, though, crown is light enough that you can drive some intermediate nails into drywall only and still gain some strength from that. Use a stud finder to locate the studs. Often, crown molding will not reach the entire length of a wall. A nearly invisible way to stitch two straight pieces is with a scarf joint. Cut the left piece at 45 degrees, as if cutting it to fit into the left side of an inside corner. Cut the adjacent, right-hand piece as if cutting the right side of an outside corner. Fit the two together and nail into place. Crown molding is sometimes installed along the tops of kitchen or bathroom wall cabinets to dress up the soffits and improve modestly attractive cabinets. Installation works the same as with wall crown, except the top of the trim is not attached to the ceiling. Instead, it hangs in the air, attached at the bottom, unattached at the top. Because cabinets are made of wood, though, this half-attachment works fine. Brads hold firmly into cabinets' plywood or MDF boxes. With regular crown molding installation, every angle is 90 degrees. Now imagine that the wall-to-ceiling angle is greater than 90 degrees. This describes the difficulty of installing crown in rooms with vaulted ceilings. It doesn't have to be so mind-bending, says trim and molding expert Ken O'Brien. Rather than trying to reconcile 90-degree angle walls with walls that are anything but 90 degrees, you can build what O'Brien terms "flying crown," much like cabinet crown installation where the top is left open. During the day, this can give the room a desirable shadow effect. Or you can install lighting behind the crown molding for a pleasant aura at night. If you're having a hard time mitering crown molding or don't even want to go there in the first place, corner blocks are one way to avoid nearly all miter cuts. Corner blocks are pieces of trim that are installed on inside or outside corners. They substitute for the 45-degree junction or coped joint of two crown strips. Each strip meets straight onto the block at a 90-degree angle. Not only do corner blocks make installation easier, they add an ornate, elegant, and elaborate touch to your home. One alternative to miter cutting crown molding is coping. Because crown molding swells and contracts with the seasons, coped joints do not open up as much as mitered joints do. If you have an entire house of crown molding ahead of you, purchase a crown molding support: a brace that firmly holds the trim up against the ceiling. Purchase the longest possible crown molding, as this will help you span entire walls without patching together two pieces with scarf joints. Use paintable caulk to cover gaps between crown molding and walls or ceilings. When Should You Paint Crown Molding: Before or After Installation? It's the eternal debate: paint crown molding before or after you install it? On the one hand, painting crown molding that is already in place means the careful application of painter's tape, a potentially messy room, and paint bleeding under the tape. As a positive, you can install without worrying about damaging the trim's painted surface. On the other side, if you paint your crown molding outside or in a workshop prior to installation, mess is not an issue. After you install the crown, lines will be precise, no bleed-through. But you will have to touch up the paint, often significantly so. Trim installers and painters will all have a different answer, the only consistency being that the crown should be primed before installation to protect against swelling and shrinkage. Crown molding does not always have to be installed against both the wall and the ceiling. For a fun effect, consider installing the crown only against the wall and moving it downward about one or two inches. The gap you create at the top provides a V-shaped pocket that can disguise speaker wires or LED tape lighting. Older style heavy plastic tube-covered rope lights are slowly being supplanted by ultra lightweight LED tape (strip) lighting. These are perfect for installing behind gapped crown molding to add cool, exciting, and lively moods to a room. Also, lighted crown molding can act as a friendlier substitute for glaring general room lighting from ceiling lights. There are two alternatives to rigid wood crown molding. The first is a flexible plastic crown, such as Easy Crown Molding, that can be cut with scissors and applied with peel-and-stick adhesive. The second is a rigid, high-density polystyrene molding, such as So Simple Crown, that is is cut with a miter saw. The flexible product is easy to cut and install. Its flexibility allows it to conform to wall imperfections. However, the peel-and-stick adhesive can loosen and fail over time. Rigid polystyrene crown is closer to real wood crown molding. Because it is light-weight, it can be applied with caulking. Unlike wood, it is not affected by changes in relative humidity. One disadvantage is that, upon removal, the molding may damage the ceiling and walls because the caulking may pull away paint, drywall paper, or plaster. Caulking residue may also be left behind. 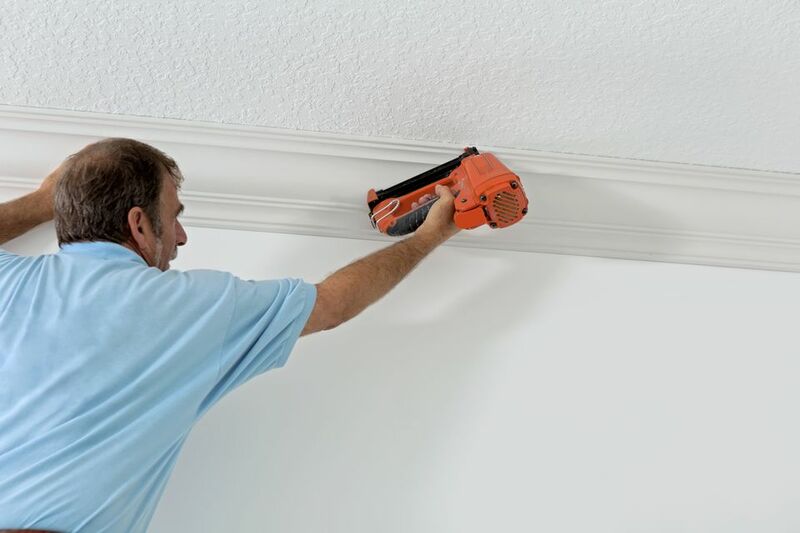 If installing your own crown molding seems a bit daunting, who can you hire to do it for you? Few tradespeople specialize only in crown molding installation. But large metro areas, especially those with older housing stock, may have some individuals or small firms that do only trim, molding, and millwork fabrication and installation. Finish carpentry is the larger general category for the type of professional who can install crown molding for you. Or you can search an online contractor matching service such as HomeAdvisor in categories such as interior trim or molding installation.